Cost: $35-40 (US) defending where you by it from. Availability: Mass Retail I got mine from Wal*Mart for $35. 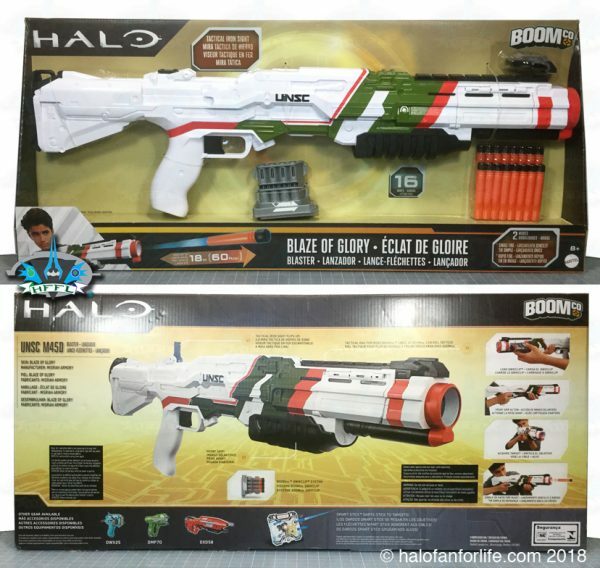 The Blaze of Glory is one of a rare few of the BoomCo dart guns that has the distinction of having in-game deco. This displays very nicely on the packaging as seen below. Lots of useful info on the back! Here’s a close-up of some of that info, showing you how to load, pump the gun and fire it. Everything you see on the packaging, plus the instruction manual (which is hidden between the cardboard parts of the packaging) is seen below. Nice that we get a hefty 16 darts with this one! 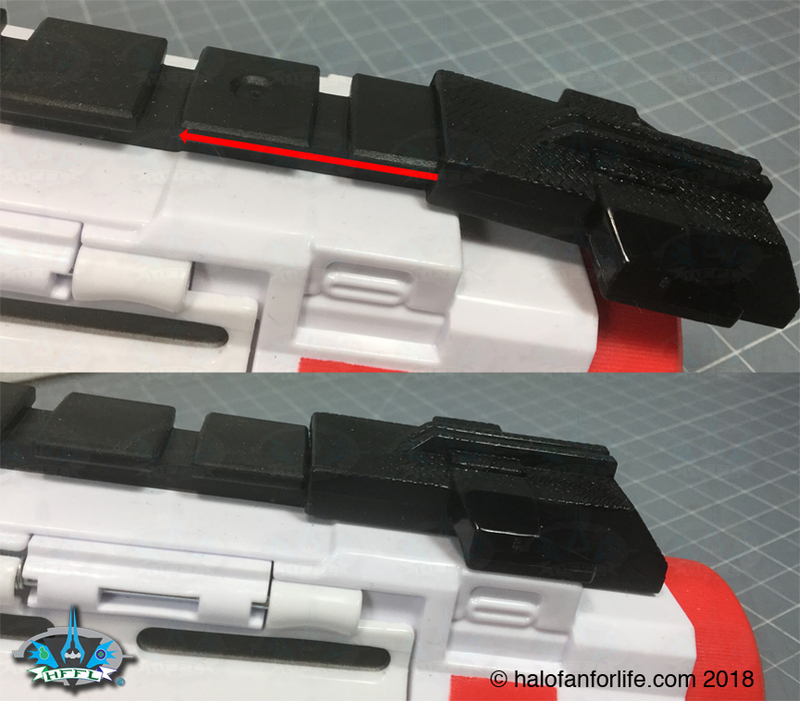 There is a piece on the front that you have to slide in place. See thin red arrow/line. Only one magazine is included with the Blaze of Glory. 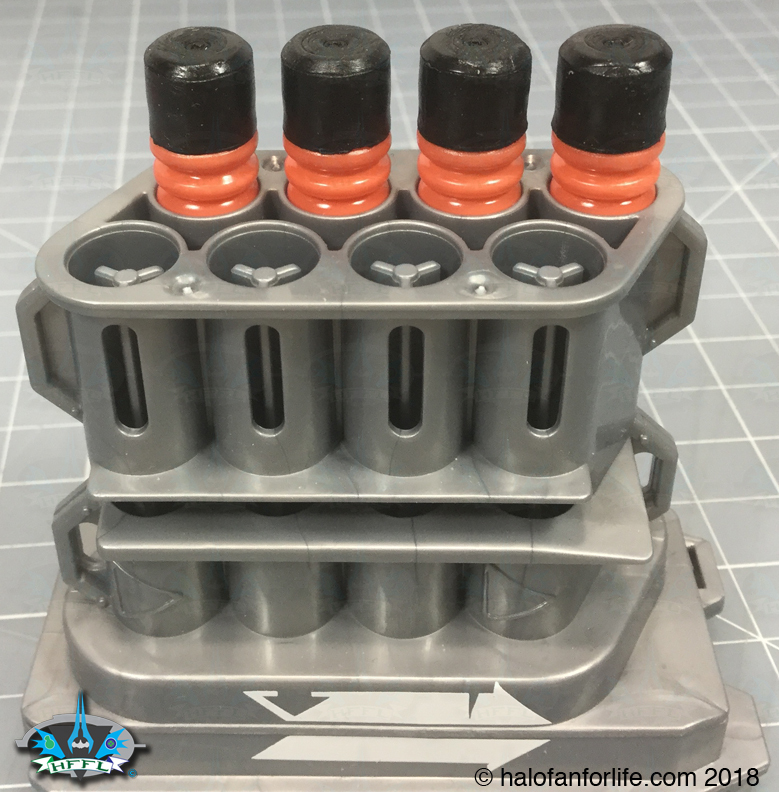 It fits 8 of the included 16 darts. Below I’ve shown just 4 of the darts loaded. 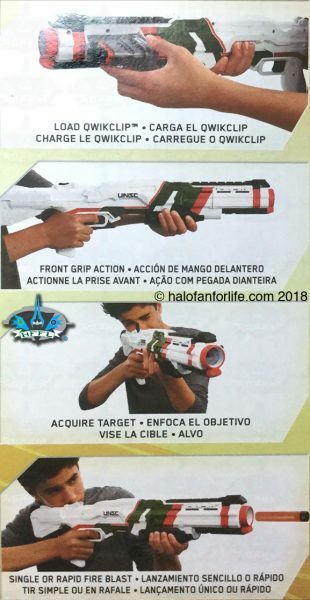 To load the Blaze of Glory, you slide the magazine in place. 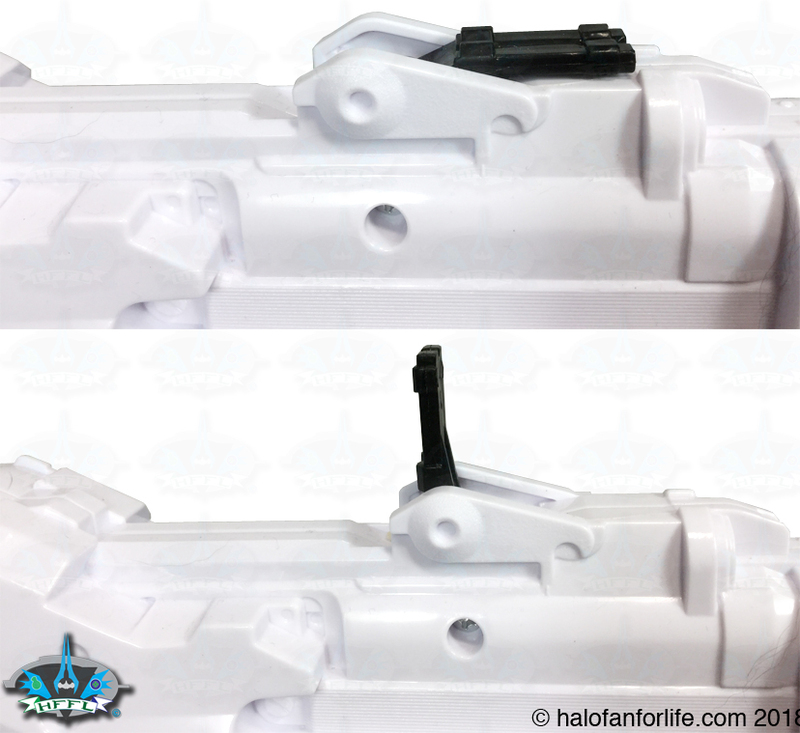 As you fire the dart gun, it advances from right to left enabling another dart to be shot out. As with most of the large BoomCO dart guns, there is a large section missing from the gun itself for the magazine to be slotted into. 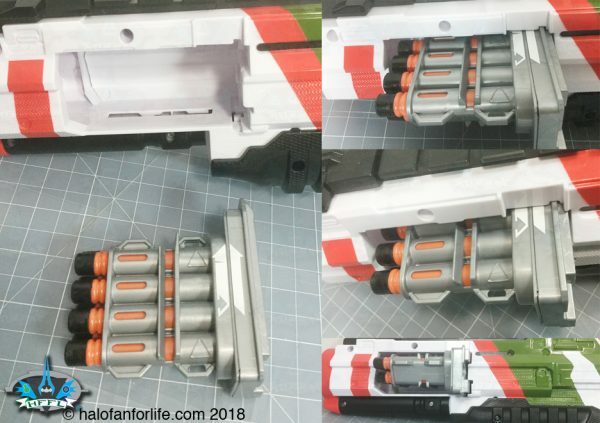 This is typically my only issue with them as I’d like that hole that’s left to be covered when the dart gun is not in use. 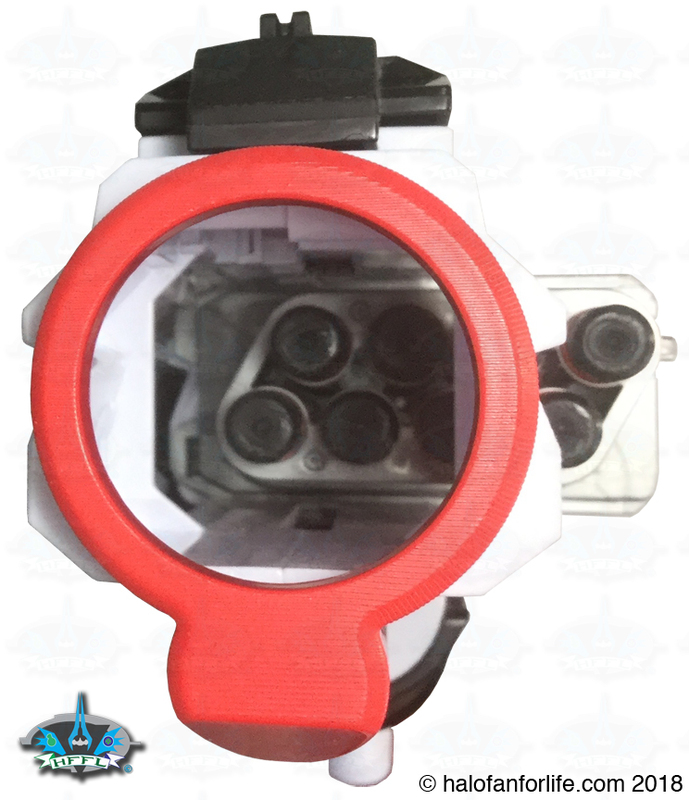 Of the BoomCo Halo dart guns I’ve reviewed thus far, this is the first to have a pivoting sight on it. nice little feature. And finally, the open end of the barrel is WIDE. This allows for the dart to fire through it unobstructed or possibly hitting the barrel itself. • The Blaze of Glory is a decent size for both adults and kids alike. • The packaging calls for this to be used by 8 years of age and older. I agree with that. Maybe even a little older. • I’m happy that this comes with 16 darts. The more darts the better! • At the normal retail price of $35, It’s priced right. • The close accuracy of the paint detail really makes this BoomCo dart gun above and beyond most of the other Halo BoomCo dart guns out there currently. Do I recommend this product? Emphatic YES! 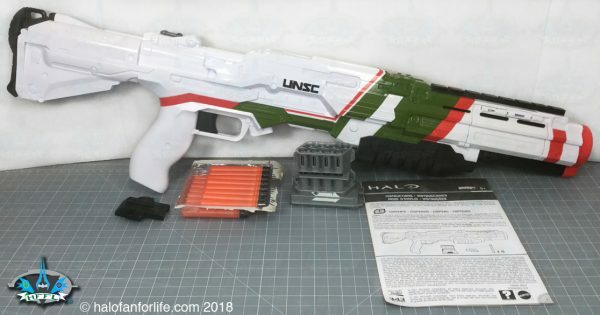 For me, it’s not just the fun factor of being a dart gun or that it’s from Halo. It’s that AND the accurate in-game paint application to it to make it a named weapon. I will be using this and all the other BoomCo Halo dart guns at my annual LAN this year. Look for a video of that some time in August (2019). Hopefully I can get some fun footage showing the distance it can shoot!